Google's relationship with television is spotty, at best. Google TV, whether as a set-top box or as a built-in product, has been an ongoing punchline. It didn't even sell television shows in the Play Store until a year ago. But Chromecast is different. It's Google's cross-platform answer to AirPlay, a video-friendly dongle that fits snuggly behind your TV. And, most importantly, they're practically giving it away. Let's talk first about what the Chromecast does (and does not) do. Just insert it into a spare HDMI port on your television, and wirelessly call up whatever's on your phone, tablet, or laptop from your cloud and directly to your television. Clean, simple, effective. It's currently compatible with Netflix, YouTube, Google Play content and, most importantly, your desktop Chrome browser. It outputs at 1080p. It's like AirPlay, if AirPlay also worked on PCs and Android phones. It also doesn't require a separate remote. You can use whatever device you're streaming from to navigate. All of this is good. In fact, in terms of usability it's right up there with the Roku LT, which is flat-out great. What's not so good? The compatible app selection is currently pretty limited, unless you happen to have the world's only robust Google Play library. The Chromecast also won't charge through your television; you'll need to plug it into a powered USB port instead of just setting and forgetting. And because Chromecast doesn't actually stream from your device—instead it pulls what you want to watch from the cloud—it almost certainly won't play your local media. All of this is unideal. The content question is pretty easily answered though; Google only just opened up its Cast SDK, meaning there's strong potential for a flood of incoming apps in the near future (Pandora is already on board). If you're a developer, you're more likely to concentrate your efforts on a universal solution than, say, specifically for Samsung. As for charging, at least it takes place out of sight, behind your television. The local media thing, well, I got nothing. Unless you run it in your browser. But! But. All of those concerns are trumped, quite easily, by the Chromecast's list price. It costs $35 to take a flier on what could well be the best streaming solution we've seen yet. Not only that, but it comes with three months of free Netflix streaming (UPDATE: JUST KIDDING THEY ENDED IT). Three months, even if you're an existing subscriber. That's a $24 value, which means that you're paying $11 bucks for the future of television. Be honest, you've spent more on a sandwich. Chromecast is potentially wonderful, and almost certainly problematic. So what? Even if you use it twice and never look at it again, it will have been totally worth it. When's the last time you could say that about any gadget, ever? Here. Get it. Before every tech writer in the world buys up the entire stock. Update: Looks like Chromecast is sold out right now on the Play Store. It's supposed to be on Amazon as well (though it's not yet), so keep an eye out for a fresh supply there later today. Update 2: The Play Store is back in business, but if you want to get your Chromecast faster (and for free shipping, if you're Prime), you'll probably want to check out Amazon instead. 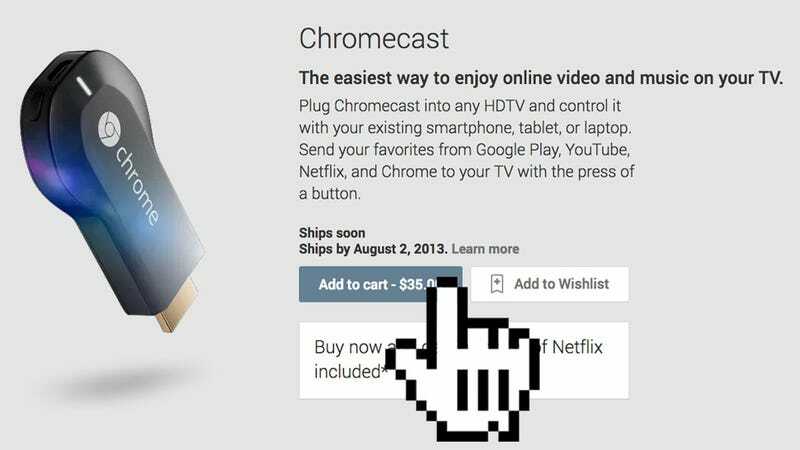 Update 3: That was fun while it lasted; Google just announced that its Netflix offer is over, presumably because Chromecast proved far more popular than expected. It appears as though if you've bought a Chromecast before now (Thursday afternoon EST) you'll still get the deal, but from here on out, no dice. That makes Chromecast still a pretty good deal but not the no-brainer that it was. Update 4: As power-publicist Brooke Hammerling kindly points out, it's actually Thursday afternoon EDT, not EST. I was clouded, in my previous update, by grief.